The short lesson for ragdolls is err on the side of caution, and less is usually best! As with any medication, unless you actually know what you are doing, and what you are treating, it is best to not make grave mistakes and let nature take its course. Finding a veterinarian that you are truly comfortable with, and who shares some of your same values about medicating illness and pain, as well as end of life matters, is very important. Sadly, veterinarian medicine is far behind human medicine, and doctors are frequently unable to help us answer our questions about our furry one’s issues. It is important that you trust or agree with the decisions your vet is likely to make during tough times. 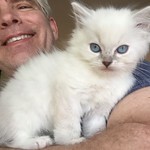 If a mother has more than one kitten wither and fade in the first four days, it is usually due to the litter being too pre-mature for life outside the womb, or that the mother’s blood type is B, or AB, and the father is blood type A. Otherwise, newborns and baby kittens are naturally protected by MDA. MDA stands for malondialdehyde, a reference value of a principal parameter for oxidative stress. Mothers naturally secrete it in their milk, providing it to their kittens during the process of nursing for the first several weeks of life. 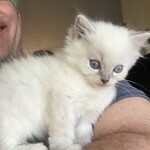 True knowledge of the level of protection and the point at which the kitten will become susceptible to infection is unknown without serological testing, so a kittens response immunologically to vaccination is unknown. The level of maternal antibodies and variation in uptake of MDA changes between litters. In general, MDA will have waned by 8 to 12 weeks of age to a level that allows an active immunological response, and because of this, an initial vaccination at 8 to 9 weeks of age followed by a second vaccination 3 to 4 weeks later is commonly recommended. 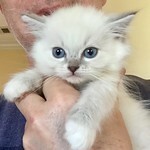 However, some kittens could have poor MDA, and may be vulnerable (and capable of responding to vaccination) at an earlier age of four weeks, while others may possess MDA at such high titres that they are incapable of responding to vaccination until sometime after 12 weeks of age. 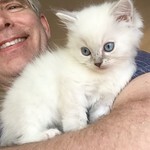 Therefore the Vaccination Guidelines Group (VGG) has recommended in the American Academy of Family Physicians (AAFP) guidelines that kittens receive a final dose at 16 weeks or older. All kittens should receive the core vaccines. A minimum of three doses – one at 8 to 9 weeks of age, a second 3 to 4 weeks later and a final dose at 16 weeks of age or older should be administered. Kittens can receive the FVRC as early as four weeks. These are the latest guidelines, we follow updates carefully, and administer vaccines within the guidelines set forth by the VGG. Therefore, we have found that we have the best success with vaccinating at 4, 8, and 12 weeks, and allowing the new owners to vaccinate at 16 weeks, one year, and three years, or as their vet sees fit. At 16 weeks of age, or at four months, we recommend that your Angel get the FVRCP Vaccine as its last in a series to protect against rhinotracheitis virus, calicivirus and panleukopenia. We also suggest that you ask your vet about Chlamydophila and Bordetella vaccines. Since Ragdolls are indoor cats they are less likely to need additional vaccines. 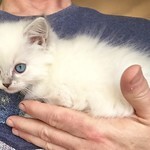 In addition, Ragdolls are sensitive to vaccinations, and have succumbed to illness and death with several vaccinations other than the core vaccines. The core vaccines again are rhinotracheitis, calicivirus and panleukopenia. All cats should receive a first booster at 12 months (one year) after completion of the above kitten vaccination course (this will ensure adequate vaccine-induced immunity for cats that may not have adequately responded to the primary course). Following this first booster, subsequent revaccinations are given at intervals of three (3) years or longer, unless special conditions apply. Adult cats of unknown vaccination status (strays and rescues) should receive a single initial Modified Live Virus (MLV) core vaccine injection followed by a booster vaccination one year later. Chlamydophila looks like conjunctivitis and an upper respiratory infection. It frequently affects the eyes with discharge. It’s not life-threatening, but for cats who live outside, spend time at groomers, kennels, or around other cats, vaccination against the disease is sometimes recommended by vets. Several studies found fever and lethargy followed after vaccine with the combination vaccine containing Chlamydia (FVRCP-C). We don’t recommend this vaccine unless the disease from this pathogen has been confirmed by laboratory diagnostics as an ongoing problem. Remember that this vaccine does not prevent infection; it may only lessen symptoms. Bordetella produces coughing and sneezing, and is also likely to have runny eyes and nose, plus a fever. These symptoms are very similar to those of feline herpesvirus and feline calcivirus. The guidelines recommend one dose for a kitten no less than 16 weeks old. This is interesting since bordetella mainly affects very young kittens. It appears to be uncommon in adult cats and pet cats in general. Therefore we don’t recommend this vaccination. When you take your furball for vaccination, be sure to tell your vet if she’s been ill recently or is taking any drug treatment, because this could affect her reaction to the vaccine. NEVER vaccinate a sick cat! Revolution is a dewormer that we use at about three months. It is not necessary for our kittens, but vets like to know that new kittens have been dewormed.